Purebred and mixed breed kittens need permanent, loving homes. Choosing a new cat or kitten requires research and discussions with your significant other. If you both like long-haired felines, consider the Siberian cat, a centuries-old native to Russia's Siberian forests. Siberian cats were introduced to the United States in 1990, and they are rare and much sought after. Siberians have a long, heavy triple coat, a full mane-like ruff and a medium-length tail with thick fur. Even though Siberian cats in the U.S. do not have to survive through the frigid weather their ancestors endured, their entire coat, including the undercoat, grows thicker in the winter. The breed has somewhat oily guard hairs -- the outer hairs on cats -- and these provide Siberians with a very water resistant coat. 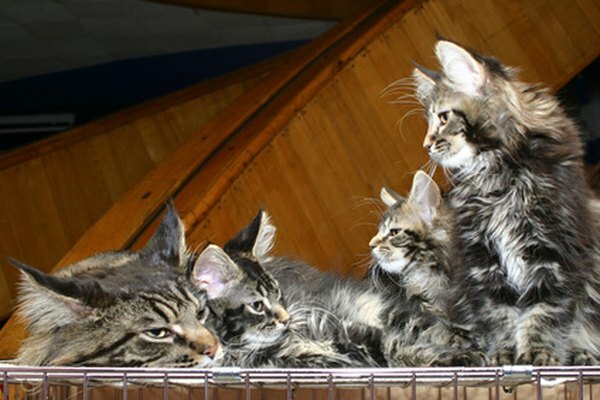 A extensive variety of colors and patterns are genetically possible for these cats’ coats, including solid colors, tortoiseshell, tabby, pointed, cream, silver, smoke and many others. Siberian cats need to be groomed on a regular basis or their thick fur will become matted. You can avoid this problem by thoroughly but gently combing their fur with a steel comb a few times a week. In preparation for their summer coat, Siberian cats shed their heavy winter coat in the spring. The next shedding season is autumn, when they shed their shorter and lighter summer coat to prepare for their thick, warm winter coat. You may need to comb or brush your Siberian cat daily during this period of heavy shedding. Siberians are medium to large, strong and sturdy cats. They are muscular felines who have large, rounded, powerful paws. Males weigh between 17 and 26 pounds and females range in weight from 13 to 17 pounds. Siberian cats mature slowly and, although most of their growth will take place between birth and 18 months, these cats may not be fully-grown adults until they are 5 years old. If you do decide to bring a Siberian cat into your household, you can look forward to a lengthy kittenhood. If you are looking for an affectionate, playful cat with great personality, a Siberian might be the perfect cat for you. These cats are fond of people and friendly with other pets. They are loyal, loving and enjoy playing fetch and other interactive games with their humans, which may be why some people say their temperament is dog-like. Siberians are mellow, relatively quiet cats who love curling up in your lap, where they chirp and purr to express contentment. The Siberian breed is very agile and can leap long distances and jump easily onto bookcases, counters and the top of refrigerators. They are intelligent, curious, quick learners who seem to enjoy toys and activities that involve problem solving. Siberian cats are fascinated with water and love playing in the sink with dripping water. Some like to stand on the edge of your bathtub touching the water and watching it move. The Siberian cat breed is very healthy and can live 12 to 15 years or more, especially when they come from a reputable breeder or knowledgeable breed-specific rescue organization. However, some of these cats carry a genetically transmitted, potentially fatal heart condition known as hypertrophic cardiomyopathy. Siberian kittens may be at risk, so when you are searching for your kitten or cat, ask breeders if they have their breeding cats examined by a veterinarian and given a yearly echocardiogram scan. No cat breed is entirely hypoallergenic, and there is no guarantee that someone who is allergic to cats will not react to a Siberian. Research on why some cats cause less extreme allergic reactions than others has not yet been completed, but the Siberian cat breed may produce lower levels of a protein that is responsible for many people’s cat allergies. This has not yet been confirmed, although some anecdotal experiences have prompted scientific investigation of allergen production levels in different cat breeds. VetInfo: Are Siberian Cats Hypoallergenic? PawPeds: The Siberian Cat - The History of Love and Public Recognition. What Kind of Cats Don't Cause Allergies? What Kind of Cat Looks Like It Has a Lion's Mane? Do Bengal Cats Shed Less Than Most Cats?